First of all, the humans looking to set up shop and establish a mining colony on Mars were a little surprised to find out that they weren’t the first ones there. The remains of a Nosferatu civilization, ancient and seemingly abandoned, were the first clue that the place wasn’t quite “move in ready”. No problem, there’s actually a living representative of the alien Nosferatu civilization handy to come along and scope things out. Enter everyone’s favorite alien vampire, Vampirella. Initially, she’s happy to head out into the Black, to get a look at a remnant of her people’s civilization, and to impress upon the people of Earth that just because she’s a vampire who lives on the blood of others doesn’t mean she’s a bad person (seems like a lot of people make that leap…). It’s right about then that the next problem presents itself. Mars isn’t exactly uninhabited. What followed over the course of the first five issues was a lot of running, a lot of yelling, and a whole slew of misunderstanding… The people orbiting Mars are unaware of the details, but they know that their people on the ground are dying horrible and bloody deaths. They also know that there’s an alien vampire down there with them. A security detail is sent down to the surface of Mars to deal with whatever threat presents itself. Conclusions are jumped to, and Vampirella finds herself caught between two groups with hostile intent. Because things just weren’t complicate enough for Vampi, she’s found a surviving member of the Nosferatu settlement, left behind in suspended animation, now awake and very… VERY hungry. Vampirella’s dilemma: she’s determined to protect the humans who inhabit her adopted home world of Earth. That includes getting the expedition survivors off of Mars and away from the alien menace, as well as keeping them from ending up the main course for her fellow vampire. 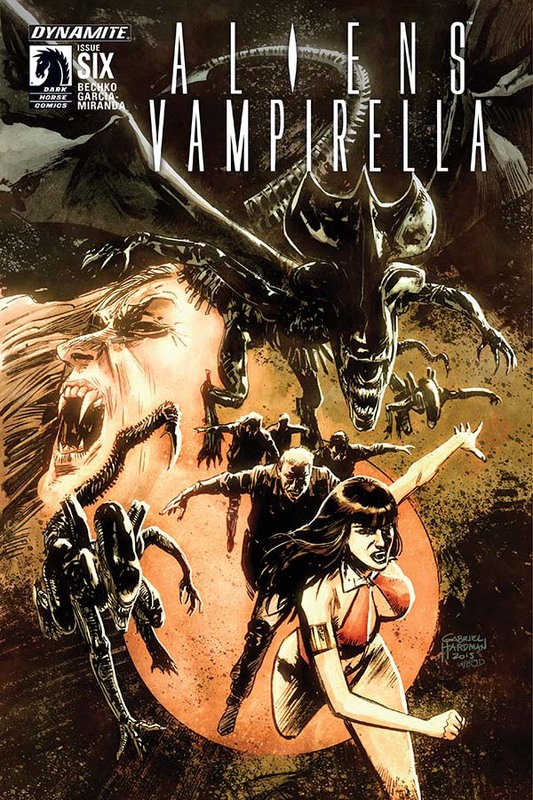 No easy thing when there’s a swarm of face huggers on one side, a squad of heavily armed and very angry soldiers on another, and a fellow vampire who’s just plain confused as to why Vampirella won’t just make a meal of the “food beasts” and be done with it. As a six issue mini-series, bringing together two of the horror genre’s iconic figures, this was a blast. It’s fast paced, always moving along on an admittedly linear path, with plenty of gore to go around. There aren’t really any surprises, unless you’re one of the victims doomed to sudden horrific death at the hands/teeth/claws of a pissed off Xenopmorph, but if you’re expecting intricately layered plot twists you might want to hold off for the Aliens/Game of Thrones crossover (editor’s note: there is no such crossover planned to the best of our knowledge… but admit it, you’d read it if there were). This is a series that serves no other purpose but as an ongoing money shot for the fans. Vampirella’s been around for longer than most comic readers, and is one of the most recognized characters in the horror comic genre. The xenomorphic Aliens have featured in multiple movie franchises, and have taken on Predators and superheroes alike, and carry with them a deeply rooted human fear of being reduced to cattle and breeding stock.